- FDA Certified. Can be updated to 50W as long as you change the laser tube and the power and add an extension cover which is for safety. - Higher Technical Volatility - Comes with effective ventilation fan for fumes and smoke extraction which can reduce all electronic component's temperature and lengthen the life of the engraver. 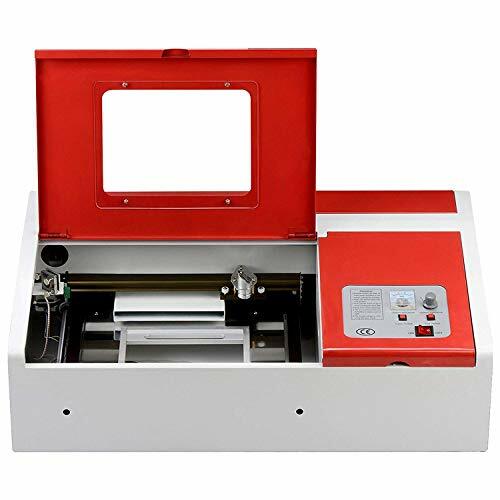 - DIY Laser Cutters - co2 40W laser engraver is able to engrave a wide range of materials including plastic, wood, plywood, leather, glass, acrylic, rubber and so on. With the laser beam cutting/engraving technology, the laser engraving machine can create excellent precision artwoks and handicrafts. - Versatile Machine Supports - It supports any printer and scanner, and is compatible with TIF international standard fonts and BMP/JPG/JPEG/WMF/EMF/PLT. After installing software, you can choose the language you need. - Included CorelDraw - CorelDraw support both Newly Seal and Newly Draw. So it can be used in both carving and cutting.